The FSC states this was an unauthorized usage of their property. The hearing took place at September 1st. 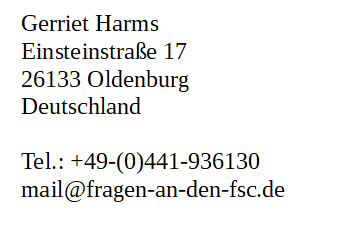 The FSC was represented by lawyers Jankowski and advocate Dr. Osnabrügge. As respresentive of FSC A.C. Mr. Wieschalla attended as well. The defendant was present himself and represented represented by his lawyerMunderloh. As was to be expected after the FSC’s first reaction to the judge’s statement, they have lodged an appeal. A general assumption, the working group eurobinia stated at that time, was that the FSC is aware that their claims against eurobinia are not likely to be given into, but is afraid to admit that the court’s statement does not hold them in the best light. 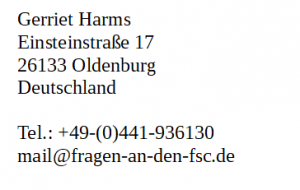 After having examined the appeal of the FSC and the reply to defence appeal of eurobinia, the higher regional court of Braunschweig answered with a indicative court order, stressing the intention to dismiss the FSC’s appeal, due to the low change of success. The court also clearly stated, that the targeted consumers will neither confuse the logo for the FSC’s nor be confused about it’s intention. It furthermore underlined the fact that the FSC has to accept and deal with criticism, and that the latter is neither denigrative not dishonest, just because it is criticism. The FSC was given 3 weeks to publish another statement or withdraw the appeal. Due to the apparent position and the court’s statement, the FSC withdrew the appeal for the trademark infringement on February 4th 2011. Therefore, they had to accept the first instance’s decision. This stresses the fact, that criticism is not only legitimate but necessary. The FSC’s unfounded accusations were not taken up by press and media. The court clearly stated, that all the content of eurobinia’s brochure was true. It additionally clearly dismissed the FSCs lawsuit against eurobinia. In all used forms the representation of the distorted logo doesn’t leave any scope of interpretation. The statement to distance oneself from the FSC and its products is seen by the court as clear and expressive. That fact should attract general attention and should encourage to continue to challange the FSC sytem in a critical way. What are the real aims of the FSC? Does the FSC Certificate meet the expactations of the customers? It the FSC certificate really an appropriate mean for the compliance with the directive of puplic procurement? About a possibly continuation of the legal action due to a possibly appeal from the first instance by the FSC, or about a legally binding judgement we will continue to inform you.